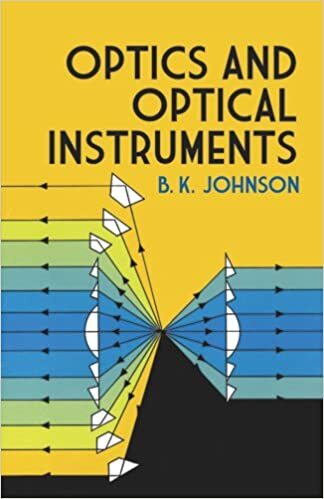 This book illustrates basic practical applications of optical principle. Working models of telescopes, microscopes, photographic lenses, and optical projection systems are diagrammed and explained in full, as are the basic experiments for determining accuracy, power, angular field of view, amount of aberration, and all other necessary facts about the instrument. Throughout the book, only elementary mathematics is used, for the benefit of the student and the beginner in the field of optics. The author, an assistant professor at the Imperial College of Science and Technology in London, shows how to set up working models of each of the four types of instruments named above, so that the reader can see for himself the effects of changing the focal length, using different types of lenses, rotating the lens, and other experiments. He also includes a number of experiments to illustrate theoretical principles such as the reflection and refraction of light and focal length measurements of concave and convex lenses. A chapter on the human eye follows, and the author explains how to set up a simple working model of the eye in order to illustrate myopia, astigmatism, hypermetropia, and the visual acuity of the eye. Professor Johnson concludes with an important chapter on the working and testing of optical glass, in which he describes the roughing of lenses, the principles of the grinding and polishing processes, abrasives, edging, angle measurement, and other important steps in the production of optical glass. An appendix is included on the cleaning of glass surfaces, silvering, photographic items, developers, collodion films, and waxes and cements used for various purposes in optical work. This is a valuable work for the student and the amateur hobbyist as well as for many who use optical instruments in science and industry. It is written clearly and economically, with the needs of the practical worker in the field of optics held constantly in mind.